Created with the latest technology in porcelain production, thin tile is only 3mm thick. Made with the finest raw materials in combination with the newest manufacturing techniques, this tile has effectively created a new category, with good reason. 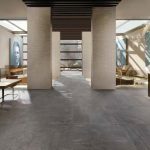 This new thin tile is incredibly lightweight, durable, flexible, easy to cut and handle, allowing an enormous possibility of installation options, only a fraction of which we have explored. One of the many benefits of choosing large porcelain tile (thin slab) would be the waterproofing aspect. You are 100% guaranteed with less joints and the epoxy to have perfect waterproofing for those wet areas of your home, like the bathroom or kitchen. For example, take a master bathroom where water is a factor, the general tile will have many joints which increase the possibility of water penetration hence costly preparation on waterproofing. With Thin Porcelain Slabs the expense will be for the look of the actual tile instead of a contingency plan. Deigning with thin porcelain slabs, not only look amazing, but will save you money in the long run. 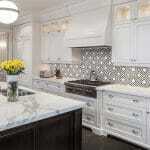 Contact us at Celebre for your next tile project. We supply, install and guarantee our work for both regular tile, and thin porcelain slabs.